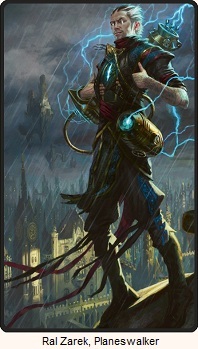 MTG Fiction: New Plan and New Poll - What should I read after Shards of Alara? New Plan and New Poll - What should I read after Shards of Alara? We have tie! Time Spiral Block and Alara Unbroken. What's the tie breaker you ask? There is none. I'm going to do both at once. 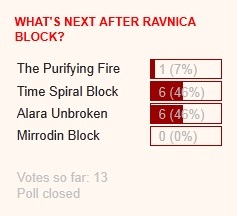 Just a few days after I put the poll up I starting thinking that while I would love to read the Time Spiral Block, it's not exactly the greatest starting point for people unfamiliar with the early Magic storylines. I haven't read all the previous books, but I've read enough of them that I'll be fine getting a few things spoiled. Eventually I'll have a Read Through posted on every book on this site, but it's going to take a while, and if people don't feel the same and want to go into it fully prepared I still want them to have a reason to come back to my site rather than wait out a whole trilogy for me to move on to something that isn't completely saturated with spoilers. It also doesn't hurt that with 66 novels in total (ignoring everything else including the comics), with a couple more coming out every year, it'll take me close to five years to finish if I only do one chapter a day. So I've decided I'm always going to do at least one chapter a day, but sometimes I'll be doing two books at a time, and now is the perfect opportunity to begin. Can't argue with the Poll results right? So there you have it. Once Dissension is complete, expect both Time Spiral and Alara Unbroken Read Throughs to begin! New Poll: What next after Alara Unbroken? I've gone through the first Planeswalker novel, moving on to the second is a reasonable continuation of that. I don't know how connected, if at all, the planeswalker novels are, but I do want to go through these in publication order, so that means I will not do Test of Metal until The Purifying Fire is complete. If people don't want to be spoiled with Future Sight Block because they want to go through the early Magic fiction in the proper order, why don't I start? Maybe it's time I begin reading The Brothers' War and get the whole ball rolling. 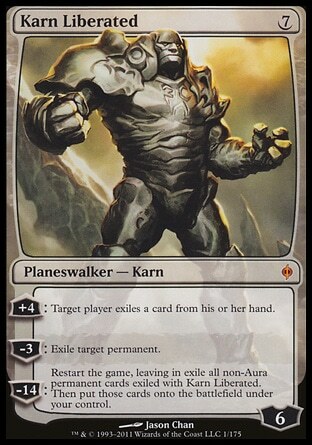 No one seemed to vote for this last time, and I don't expect any votes again, but this is a pretty self-contained trilogy without many spoilers in it besides the fact that Karn is a planeswalker (which should be quite clear already thanks to his planeswalker card and the events of New Phyrexia. With Sorin Markov as the promotional planeswalker for Dark Ascension, I would like to finish this book at some point soon. The absolute latest date would be right before the Innistrad Block Novel is released. My only hesitation is that this is another Wintermute novel and I don't know if I want to subject myself to that again just now. In my opinion, the Brother's War manages to go beyond being a good Magic Book. It is just a good book. It's the only Magic novel I've reread and I would highly recommend it. The Zendikar novel actually isn't all that bad. It was a lot better than the Scars of Mirrodin novel. It gave me hope that maybe Wintermute doesn't singlehandedly fill the bottom slots in the "Worst Magic novels ever written" list. The characters were well-developed. The prose was well-written. The story was well-paced. 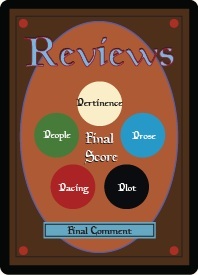 It was an adequate book all-around. I'm glad I bought it. The cover has a picture of Nissa and Sorin fighting an Eldrazi. Note: Only one of the above statements is true. The rest are false. See if you can spot the odd one out! I voted for the Zendikar novel because it helps tie in with the Innistrad one, I hope. I agree, that Wintermute is a miserable author, possibly worse than Cory J Herndon (other magic books). Sadly, I agree with the above post, there is almost nothing worthwhile in the Eldrazi fight, other than the last 20 pages or so. If you'd rather read a better novel in those, Please go Brother's War. Jeff Grubb does the magic name well.